How would you like to have your own personal instruction for Italian Genealogical Research in the comfort of your home? 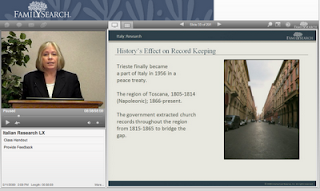 FamilySearch has come out with a basic Italian Genealogical Research class that is available for viewing. The class is approximately 58 minutes long and has a great deal of information that will assist the individual in researching their Italian Ancestry. If you would like to view the presentation and obtain the class handout, click Basic Italian Research. Have fun!